Nanny never wrote down recipes. And it wouldn't have mattered if she did; I didn't pay attention to what went into her meals -- it was the delicious end result that was my only concern. So now I've tried my best to recreate her simple, Calabrese dishes. Part Two of the Fazool Trilogy features a dish that I have never seen on a restaurant menu anywhere. And I wonder why? Thankfully, my grandmother, known in the family as "Nanny," introduced me to the tiny legume and the hearty, almost meat-like broth it made when cooked and then combined with broken bits of spaghetti. Nanny never wrote down recipes. And it wouldn't have mattered if she did; I didn't pay attention to what went into her meals -- it was the delicious end result that was my only concern. So now I've tried my best to recreate her simple, Calabrese dishes. There always, however, seems to be something missing. I can never exactly duplicate what I remember... but I am getting closer. 1lb bag of dried lentils (Some use the fancy French lentils, but fancy was not in Nanny's vocabulary. She used, and so do I, the basic green, most inexpensive lentils). 6-8 cups chicken broth or water, or a combination of both. (The more liquid, the soupier the dish, which, in this case, is not a bad thing. It just depends on your mood and taste). 1 cup plum tomatoes, chopped, juice retained. Grated pecorino Romano or Parmesean Reggiano. 1 secret ingredient (the picture of which, you will find below). 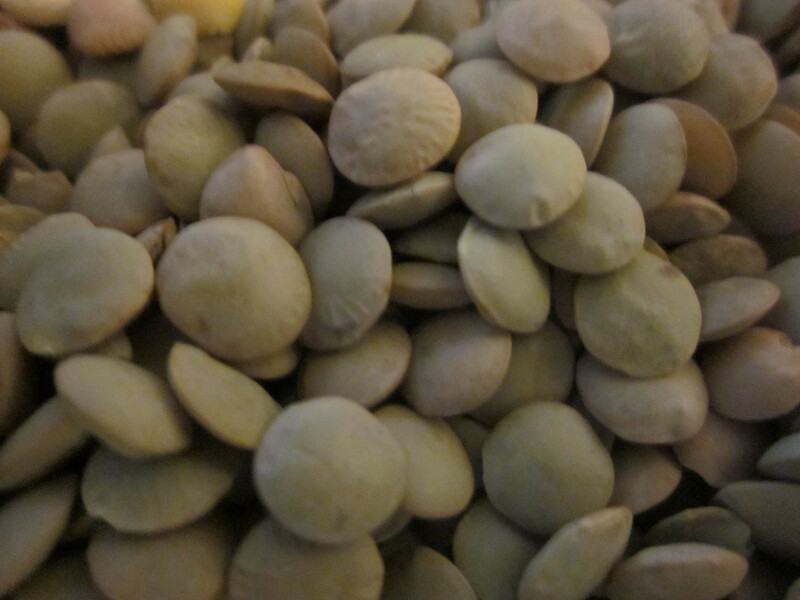 *Rinse the lentils in cold water a few times to remove any dirt or grit. *You correctly guessed the secret ingredient as a parmesean Reggiano rind. I really don't know what the rind adds to the dish; many include one when they make Sunday sauce and pasta e fagioli (Part Three of the Trilogy to come). If nothing else, the rind imparts a salty, aged flavor to the creation that maybe is just in our heads. Or maybe not. If you have one lying around, toss it in. It won't hurt the dish. In a Dutch oven, heat the olive oil. Sauté the onions until soft; about five minutes over medium heat. Add the garlic and thyme for another one to two minutes. Toss in the lentils and sauté for about a minute. Pour in the chicken broth/water and the tomatoes. Bring to boil and then reduce to a simmer. Cook for about 30-40 minutes, or until the lentils are soft, but not mushy. You can add the spaghetti and cook it with the lentils, but I prefer to cook them separately. So, in another pot, boil water and add the spaghetti pieces. Cook until al dente, drain, but reserve a few tablespoons of the cooking liquid. Add the spaghetti pieces and the remains of the pasta cooking liquid to the lentils. Stir, and cook for another minute or two. Top with grated cheese and a little chopped parsely. Enjoy with crusty bread and a salad.